This time, don't do it for the 'gram. It's not worth it. 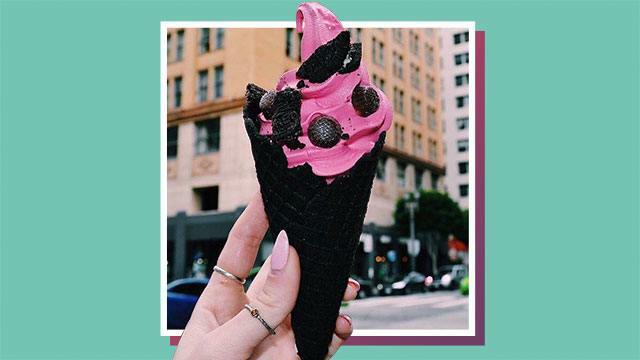 If you're on top of your food game, then you may have noticed a recent shift on your Instagram feed. People seem to be moving away from rainbow lattes and unicorn-anything in exchange for charcoal-themed eats. And sure, it's probably making your 14-year-old emo self come alive again, but this trend isn't exactly good for you. ICYDK, charcoal is burnt organic matter. It becomes activated when exposed to gases at high temperatures, which makes it bind to other matter. Medical professionals sometimes use activated charcoal to treat drug overdoses and poisoning because, again, it binds with the substance before your body absorbs it. So, in that sense, it's good. But activated charcoal can also bind to things you want to actually keep, like vitamins and minerals. Also, consuming activated charcoal can mess with how you absorb medications you take. Other people have also started using charcoal as a way to detox. Alissa Rumsey, M.S., R.D., spokeswoman for the Academy of Nutrition and Dietetics, warns against doing so: "The idea that activated charcoal will cleanse your body from toxins doesn't make sense, as it will only bind to things in your stomach and small intestine—not any 'toxins' that have built up in your body." The more you know, folks.